Why do I embrace the worst possible scenario? I woke up the other morning covered in red blotches. All over my arms, and some on my lower back too. They began to form into nasty wheals, and my first thought was that it was an allergic reaction, perhaps to something I'd eaten. I racked back over what I'd eaten the previous 24hrs. I tried to think of anything I'd eaten that I'd never eaten before. And I remembered the previous evening succumbing to a pre-made supermarket Chicken Kiev. So I immediately put that down as the culprit of my red blotches. I NEVER eat processed food, but for some reason I'd gone against all my natural instincts and eaten this toxic substance. The wheals didn't go down, and in fact they got worse. They started to break out into little tiny sores. And I began to think that if it was an allergic reaction to the supermarket Chicken Kiev, then perhaps I should have shown other symptoms as well – like asthmatic breathing, sweats, etc. I went online, found myself on WebMD, and saw that I most probably had hives – but I couldn't figure out what might have caused them. Meanwhile the wheals were getting larger, more itchy, and the sores were starting to seep. Pretty awful. So I went to the doctor. Seems that I've been going to the doctor a bit lately, after not going for years. The doctor examined me, asked some questions, and told me it was exema. It met all the symptoms. He asked if I'd been stressed lately, and I recalled the previous few days at the university, dealing with the students. That was stressful. The doctor said I had to be careful that this didn't become permanent, and prescribed various ointments, creams and pills. I got the scripts filled and it cost me $126. The doctor was $75. I got scared. Exema. That's serious. And it's not pretty. Was my immune system breaking down? Was there some larger underlying cause? Given the stress I've lived under for so many years, was my body starting to cave in? I took the pills, put the creams on, it didn't really help. Still there were questions… Why was it just on my arms and neck and hands? Why not my legs, or body? And why were the wheals so itchy? And then I remembered. The evening I'd had that putrid Chicken Kiev, I'd gone outside to take a phone call. 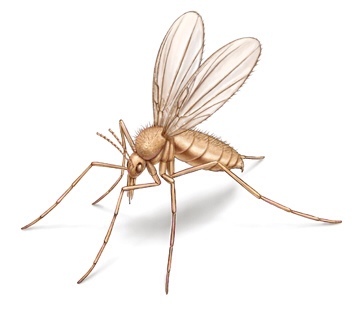 It was coming on dusk, I sat on a chair in the garden and I got eaten by little tiny sandflies. They'd really made a meal of me. I was in a t-shirt and jeans, and the hand that had been holding the phone, that was relatively stationary, had the most bites. There'd been one other time I'd been bitten by sandflies – when I slept on a beach up in Arnhem Land in the Northern Territory, hanging out with some aboriginal tribal elders. I recall having the same kind of reaction. Very itchy large red wheals that developed into sores. So I didn't have hives. I didn't have exema. My immune system wasn't breaking down. The doctor got it all wrong. When my left foot lost sensitivity at the end of my Camino, I thought I was developing MS. Or it was the onset of early diabetes. I'd gone online. Onto WedMD. Yep. MS. Diabetes. Why do I always default to the worst possible scenario? oh yikes Bill, they look like Canada’s national bird THE MOSQUITO, must be the Australian version (they also look a bit like flying ants). Really doesn’t matter, those suckers bite and it hurts and itches and you look like being tattooed without the benefit of artistic impressions. Can you take antihistamines for that? I think it is natural to either think the worst or on the flip side be an ostrich. I like to take the middle road, after the immediate “worst”, bunch in the gut feeling… I go to “don’t be such a worry wart” to let me see what the Internet MD says (not such a good thing – but then I remember you come from MD stock), mine is then to talk to my daughter – the nurse, then relax and get my balance (remember I am a Libra) and start the “what if” game and make lists of possible outcomes—- Oh but wait! that is my pre-camino personality rearing its head – lists and plans. Nah, I don’t think so. I think I just have to stop reading WebMD! The post was really meant to show how doctors and online medical help sites are really quite useless, and in fact breed fear. Nine times out of ten, any presenting medical condition has, at it’s root source, a very simple and logical explanation. In my case my itchy red bites were caused by sand flies. Because I had been concentrating on the phone call, I’d forgotten that I’d been bitten. It was only after I looked at myself in the mirror, saw the bites for what they really were – BUG BITES – that I realised the silliness I’d been through. The doctor should have picked it up. Bug bites are vastly different to exema. But he prescribed me $126 of medication for exema. Equally dumb though was me reading WebMD and considering I could have hives, or worse. Other then my previous sandfly attack many years previously, this has never happened to me before. So when your arms and legs break put in suppurating red wheals, it’s natural to want to get it checked out. But my point is this – invariably there is a simple explanation. It’s just a matter of finding it. Dr. Goigle can incite unwarranted fears. If I let my thoughts wander too far, I can tend at times, to think of bad things, if not the worst. I was very guilty of that last winter when I went through a depressed state and tended to have a very negative outlook. Interestingly, that changed when Jill and I decided to walk the Camino. I think I was fearful of our potential divorce, and as you who followed me know, we talked about it quite a bit while walking, but we had a wonderful time together. The fact is, we have now decided to have the most amicable divorce that two people could have, and we remain best friends and want only the best for each other. About the only thing that will change in our lives is that we will no longer be married. It was simply a matter of two people taking divergent paths, but that does not make either of us wrong or selfish. I envisioned all sorts of negativity coming from a potential divorce, notwithstanding the fact that we continuously told each other it would not be so. The point here is that even though we are willfully getting a very friendly divorce, the nightmare that I envisioned at times did not occur. I knew that intellectually, but still projected the worst at times. This divorce is so supportive and friendly that it took us only 5 minutes over Starbucks to reach a property agreement, and by mutual agreement, I have filed a pro se (no lawyer) divorce in Texas. Jill remains my best friend and will continue to be so. I want only the best for her, and who knows what might happen between us in the future. This is a little personal example that most of what we worry about never happens, so I now try to mandate that I simply live today and try not to worry too much, if at all, about tomorrow. That is part of what I have consistently called living without expectation. Maybe living without worry would be synonymous. Somewhere in the Bible there is a scripture that says to not worry about tomorrow because today has enough problems of it’s on. I find that life seldom unfolds the way I would have expected it to, thus, I try to never expect, but to appreciate what comes. Firstly, I’m really pleased to hear that you and Jill are both happy now that you’ve finally made a decision. That must be a huge relief to you both. And it seems there is such a very strong comparability between you guys – it would have been dreadful had the relationship soured. As for your way of approaching each day, I admire that, and wish I had the capacity to do that. I perpetually forward think, and am always planning weeks, months, and years in advance. It’s probably why I don’t sleep much! That is so sweet of you to say. Folks who can divorce amicably are few and far between, and deserve a special place in heaven. I was divorced from my first wife 15 years ago, after 33 years of marriage and 3 children. Lawyers were required. She still lives to hate me and still tells anyone who will listen how awful I am. It is such a waste of her life, but it is her life to waste if she chooses. Jill and I have been talking about it for a couple of years merely because we were heading in more or less different directions. Who knows what the future will hold? This is just a necessary step in the process. Thanks again for your great reinforcement. Thank you for that Sister. Bill, while your comment was meant to address the way misuse of medical websites, combined with worry and a creative mind, can draw some wild conclusions.I think what Britta,Julie and I were pointing out is how that kind of “doom thinking” very often doesn’t stop at just one issue, but can become a way of life-even when our common sense and experience know better! I find that any kind of negativity easily sneaks into every part of our live, and we have to see that for what it is, and stop it before it becomes self-destructive! But I would only say that fear and paranoia have also fuelled some of the greatest artistic minds… and been the source of some true masterpieces in art, sculpture, music, literature, and theatre.